In the modern world, the likelihood of data breaches and security threats is ever-increasing. Email, in particular, is the leading threat vector for ransomware, phishing, data theft and other attacks. Unfortunately, most businesses simply don’t have the time or the resources to come up with solutions to address these threats – as a result, they are leaving their users and data vulnerable to attacks. Thankfully, this is where Barracuda Essentials for Office 365 comes in. First though, it’s important to note that we don’t provide endorsements lightly (and we’re not tied to promoting particular brands or services), so it is significant that we’ve chosen to provide this one, because we really believe in the product. Barracuda Essentials is a comprehensive, cloud-based service that provides protection against spam, malware, phishing emails and more. Through a range of microservices, including advanced threat protection over email, tamper-proof archiving and data protection, Barracuda Essentials can protect your business from the most advanced email attacks. The extensive Barracuda Essentials product suite is affordable, easy to use, effective and essential for businesses that have a growing need for IT security, cloud backup and/or email recovery. Protection from email-borne threats – you can worry less about Jeremy in Accounts who has a history of clicking malicious links in email. Barracuda will replace every link in every email with its own and proactively “open” the link to see what happens. Links that lead to the installation of malware or other threats will be flagged and your users diverted from them. Advanced threat protection against zero-day attacks – this means that even freshly launched attacks that exploit a previously unknown weakness in software will quickly have a machine-learned response triggering, to protect the network of Barracuda users. You can browse the whole suite of Barracuda Essentials services here. Here is more detail on three features we like in particular: Link Protection, Advanced Email Archiving and Email Backup. A popular method that attackers use to deliver malware relies on URLs that contain malicious code. Through Link Protection, fraudulent links inside plain-text and HTML emails are automatically re-written, so that Barracuda can sandbox the request at click time and block malicious links. “Sandboxing” is the term borrowed from bomb disposal where dangerous items (in this case, links) are handled in a safe environment where, even when they explode, they don’t do any damage. Link protection comes as part of the Email Security features of Essentials. As well as scanning every attachment and fully sandboxing it so that malware is detonated before your users see the email, the product also adds a layer of protection around links in emails, checking the target before the user is permitted to see the page. This protects your users from landing on fake or compromised web pages that appear to be genuine whilst your browser is secretly injected with malicious code. Having this end-to-end protection over your email is reassuring. You can even tie in educational videos and quizzes when a user who clicked a bad link is redirected to a safe landing page to help make them part of your company’s defence, rather than the victims of an attack. Barracuda’s Advanced Email Archiving solutions will capture and store your data securely, for as long as required, without the risk of amendment or deletion. Advanced Email Archiving follows the accepted “best practice” approach for compliance, meaning an original copy of every email is archived into a separate immutable store, for long-term retention and preservation. This service is integrated with all standards-based email servers (such as Exchange) and is ideal for cloud services such as Office 365. Users are able to access, search, retrieve and export archived messages instantly using any device. This service is part of the Archiving, Compliance and eDiscovery feature set. 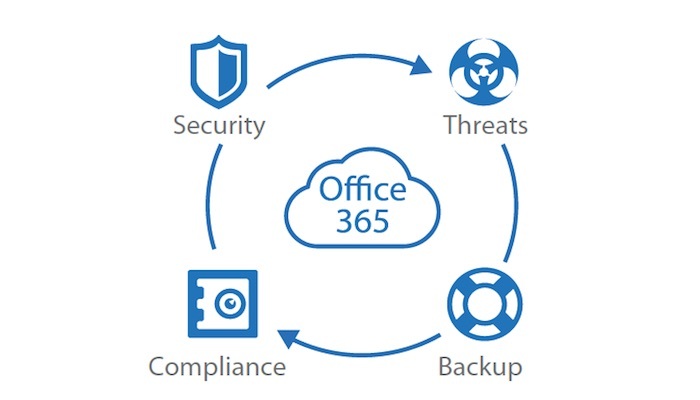 Barracuda Essentials’ Cloud-to-Cloud Backup Service backs up all of your Office 365 data to secure cloud storage without the need for on-premises infrastructure. With this feature, you can backup data on demand and/or according to an automated schedule. All Exchange Online, SharePoint Online and OneDrive for Business data is deduplicated and compressed for maximum storage efficiency and reduced backup windows before being stored in the Barracuda Cloud. This service is part of the Backup, Recovery and Business Continuity feature set. With Barracuda Essentials, you receive an extra layer of granular security and gain access to a fantastic range of additional services that add email retention, archiving and eDiscovery capabilities to Office 365. Want to find out more about whether your business could benefit from Barracuda Essentials for Office 365? Don’t hesitate to give us a call. ← Phishing, Spear-Phishing and Whaling – What’s the Difference?